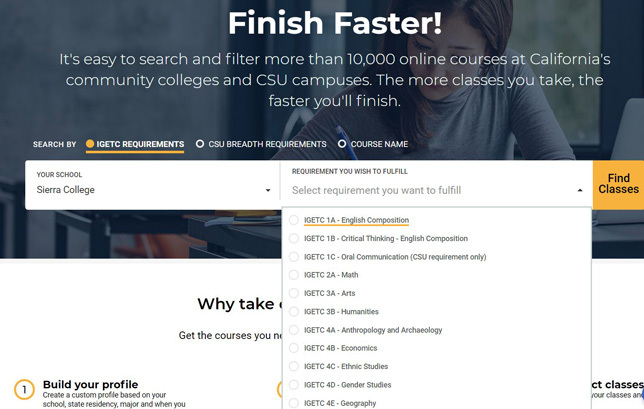 The California State University and California Community Colleges systems have teamed up to launch a new online course finder that will provide students enrolled at either set of institutions access to more than 10,000 online, transferable classes. The program is live in time for students to take summer 2018 classes. "Finish Faster," as it's called, is part of the Online Education Initiative, a collaborative effort among several community colleges in the state to push students to finish their educational goals faster. Besides the online courses, the project incorporates resources to help online students succeed, including counseling, tutoring and access to library services. According to program officials, students attending a four-year institution gain the flexibility to finish lower-division general education requirements during the summer through the online coursework. 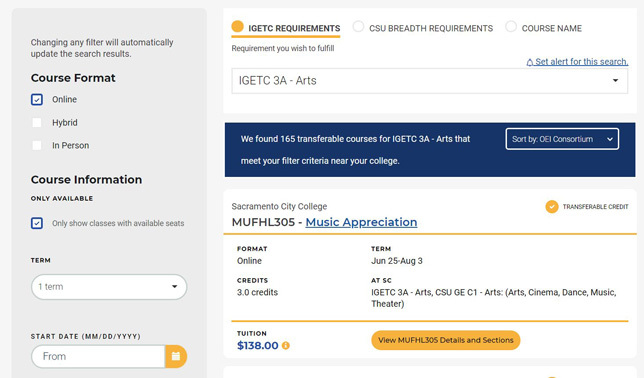 The course search can be done based on subject matter, Intersegmental General Education Transfer Curriculum (IGETC) requirements that apply to both CSU or the University of California institutions, or CSU GE "Breadth" requirements. Search results are sorted by distance from the institution the student currently attends and can be filtered by start date, modality (online or hybrid) and price using a college-course search optimizer. The course search can be done based on subject matter as well as institutional transfer or degree requirements. "This collaboration with ... CSU gives both systems the opportunity to better serve our state's students so they can complete their higher education goals even faster," said Alice Perez, vice chancellor of Academic Affairs for CCC, in a prepared statement. Added Gerry Hanley, assistant vice chancellor with Academic Technology Services for the CSU Office of the Chancellor, the collaboration is expected to "help remove administrative and financial barriers facing students, allowing us to better meet students' needs and facilitate degree completion." Both college systems have invested deeply in online instruction. Last fall, CSU had over 5,200 online course sections and more than 118,000 students enrolled in at least one online course. CCC schools served more than 860,000 students in 68,000 online course sections offered during the year.